Hitting theaters on September 12th, for one night only, is May It Last: A Portrait of the Avett Brothers. The documentary, directed and produced by Judd Apatow and Michael Bonfiglio, is an intimate look at North Carolina band The Avett Brothers. 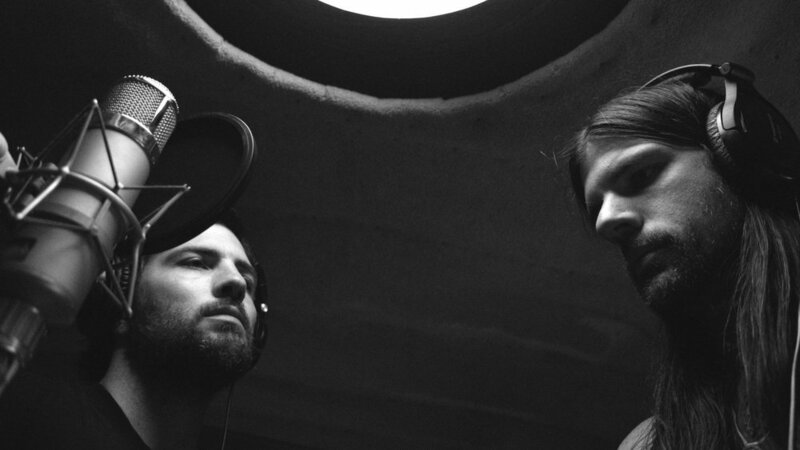 The band, led by brothers Scott and Seth Avett, allow cameras into their world to document the making of their album True Sadness as well as their home lives. If you expect to see behind the scenes drama or sibling wars, you've come to the wrong place. The brothers display a genuine affection for each other. If you're looking for a 'making of an album' type documentary, again wrong place. Yes, they make an album during the course of the film, but to me, it's more of an aside. This film is about family...blood and chosen. It's about friendships. It's about down to earth people who happen to create music and share it with the world. In the film, producer Rick Rubin mentions a history of families not getting along in bands. You don't get that with the Avett's. The brothers, opposites, get on well. Scott Avett goes from full-tilt, look at me, let me entertain you mode to reflective awe...something we get to witness as he's looking at his daughter on her sixth birthday. On the flip side, Seth Avett displays a more low-key, easygoing personality with a healthy admiration of his big brother. I suspect it's their respect and understanding of their opposite natures that make them work so well together. They seem to act as each others grounding wire. We get to see photos and hear audio of the brothers as children. We hear stories of how protective Scott was (and probably still is) of his little brother while also being a typical big brother. It's interesting watching them write together. You don't see battling egos. They're partners that flow well together. They bounce ideas off each other and at times, one picks up where the other left off with a natural ease ending with shared looks of reverence. We get a glimpse into core member Bob Crawford's world as well. He gives you a sense of unwavering calm. It's with him that you really get a sense of the chosen family aspect of the group. When the band members speak of Bob and his daughter's illness you can hear the love and loyalty in their voices. The core group has surrounded themselves with a team of chosen family and longtime friends that has helped them go from small stages (I first saw them on the smallest stage at a festival) to arenas and Grammy nominations. They have a wealth of strength and support at home that allows and encourages the work lives they've chosen. Proud papa Jim Avett I think sums it up best, 'I'd like these guys even if they weren't my sons.' While he was speaking on the music, I think it fits for them as people. You walk away from this film with a smile. They're just a likable group of people who for 104 minutes makes you feel like a part of the family. You don't need to be a fan of The Avett Brothers to enjoy May It Last. You just need to appreciate music and passion. Oh, and Seth's "C-Sections and Railway Trestles" song is stuck in my head on a loop. The Avett Brothers released True Sadness, in June 2016. You can pick it up HERE.